Want to See This Business? Select "Want Name/Address" and go by, but Don't Talk to People About it For Sale! Rare chance to take over a near new beach area restaurant in San Diego. Sellers recent complete remodel creates fantastic opportunity to continue and expand the current operations or bring your own concept to this excellent location. Walking distance from the board walk, sand and surf, the streets sidewalks are filled with customers. Huge foot traffic area, near lawn with nightly events and gatherings. Locals and tourist both fill this iconic street looking for breakfast, lunch and dinner and late- night options, are you ready to be one of those options? Sellers spent over 240k to build this restaurant out and now their plans have changed. Step right in at close to half off the build out price. Surrounded by bars, breweries and the beach, the demographics are ideal for the current or any number of restaurant concepts. In addition to the ideal restaurant location, it’s the value of the lease that will make you want to open tomorrow in this restaurant space. The open style kitchen has everything you will need and it’s all in near new condition. 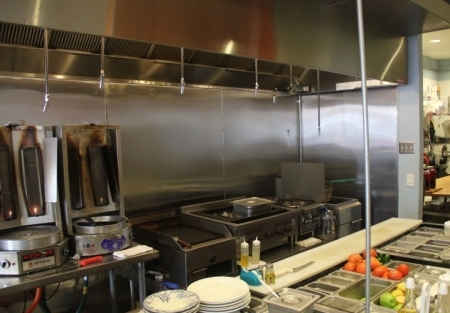 Captive air hood with fire suppression, convection oven, grill, fryer, gyro spinner you are all set. The restaurant is a very well designed 873 square feet and the rent is only $1938/month plus NNN of approximately $600. Current lease term expires 9/30/2018 with two five-year options available. Current owner has been in the restaurant business for 40 years and he is ready to retire. They have done all the time consuming and expensive work, now is your chance to capitalize on a restaurant that with a motivated owner/ operator is ready to boom!